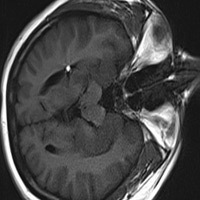 A 37-year-old female presented with headache after insertion of a pain pump. MR imaging prior to the patient’s pain pump catheter insertion was normal. After the pain pump insertion, T1 and T2 weighted fast imaging sequences indicate the appearance of high-signal-intensity lesions located at the most superior part of each lateral ventricle. Fat-saturated imaging confirmed that the lesions represented fat. Images taken from the left lateral decubitus (Figure 1), supine (Figure 2), and prone positions (Figure 3) show the lesions shifting to a nondependent location. Free-floating fat within the cerebrospinal fluid (CSF). MR imaging of the patient’s head in various positions helped determine whether the lesions were free-floating within the ventricular system. The presence of fat in the ventricles was not present on imaging performed prior to the patient's pain pump procedure, suggesting the procedure itself as a possible source. Previous reports show that the procedural insertion of a pain pump may in fact lead to the presence of fat lobules within the CSF.1 Furthermore, the patient had no other known condition or procedure that could have otherwise led to the presence of fat within the ventricular system. 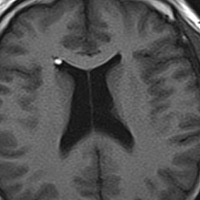 In this case, varying the positioning of the patient’s head proved to be a useful diagnostic tool as it was instrumental in indicating that the lesions observed through MR imaging represented free-floating masses that were unattached to the ventricular wall. Despite the uncommon underlying reason for the presence of fat within the CSF, this case indicates that varying the positioning of a patient’s head potentially serves as a useful technique in diagnosing free-floating masses as opposed to masses that are fixed to the ependyma. Due to the potential of free-floating masses to become lodged within the cerebral aqueduct and cause noncommunicating hydrocephalus, scanning the patient in different positions serves as an important diagnostic procedure. Positioning the patient’s head in the prone and decubitus positions can yield crucial diagnostic information in a noninvasive manner. Given that newer high-field MRIs have faster imaging times, brain scans from multiple positions have recently become more feasible. The obtained diagnostic information can be used to determine whether interventricular lesions are fixed or freely mobile. Distinguishing between fixed and mobile lesions is especially vital in surgical planning, given that mobile lesions may relocate based on the position of the patient. In conclusion, when an intraventricular lesion is encountered, the patient should be scanned in both the prone and lateral decubitus positions to maximize diagnostic information. Qian Y, Ances BM, Pruitt A, Choi B, Moonis G. Intracranial fat embolization due to baclofen pump. Neurology. 2005;64(5):919. Liu JK, Gottfried ON, Salzman KL, Schmidt RH, Couldwell WT. 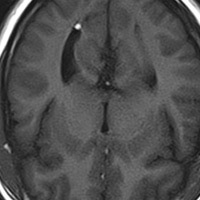 Ruptured intracranial dermoid cysts: clinical, radiographic, and surgical features. Neurosurgery. 2008;62(2):377-384. White AC. Neurocysticercosis: a major cause of neurological disease worldwide. Clin Infect Dis. 1997;24(2):101-113.